The Final Four is one of my favorite sporting events. Two amazing games with everything on the line. There’s nothing like it in sports. Interestingly, both games feature rematches from earlier in the season. With the Final Four being played in New Orleans today, I wondered who is more critical to the Buckeye’s chances of winning, big man Jared Sullinger, or senior William Buford? Sullinger is an amazing player to watch, and Buckeye fans across the globe were relieved when he decided to come back for his sophomore season. My initial hypothesis was that Sullinger’s play is the most critical to the Buckeyes chances of winning. 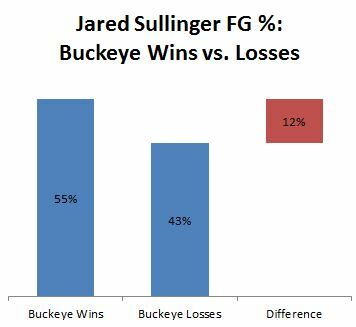 Indeed, Sullinger’s shooting percentage is 12 points higher in games where the Buckeyes win vs. games the Buckeyes lose. We need Sullinger to shoot well. When I looked at the same number for Buford, the difference was similar. Buford shoots 11 points higher in wins than losses. Add to that the fact that Buford takes more shots: 479 vs. 420 for Buford vs. Sullinger so far this season, clearly shows that Buford’s shooting % has a bigger impact on the Buckeyes chances of winning. Digging even deeper, I looked at Buford’s 3-point shooting percentage, and noticed an even wider discrepancy. 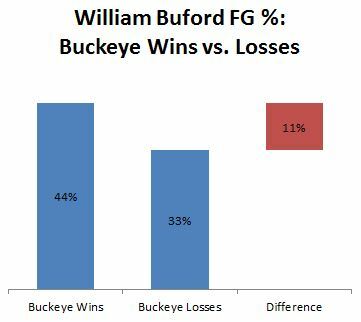 When the Buckeyes win, Buford has > 2X the 3-pt field goal % than when the Buckeyes lose. 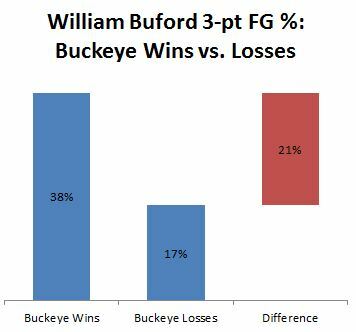 When you’re watching the second Final Four game tonight: Ohio State vs. Kansas, pay attention to William Buford’s 3-point Field Goal %. If he’s draining 3s, Ohio State has a great chance to win. If he’s bricking them, the Bucks are in trouble.